There’s been some shenanigans going on in our backyard. First it was the Chestnut-backed Chickadees, settling in to the nest box and eventually fledging some fresh new CBC’s. Then it was the Dark-eyed Juncos, with three new little Juncos in tow, showing them the ropes at the bird feeder. 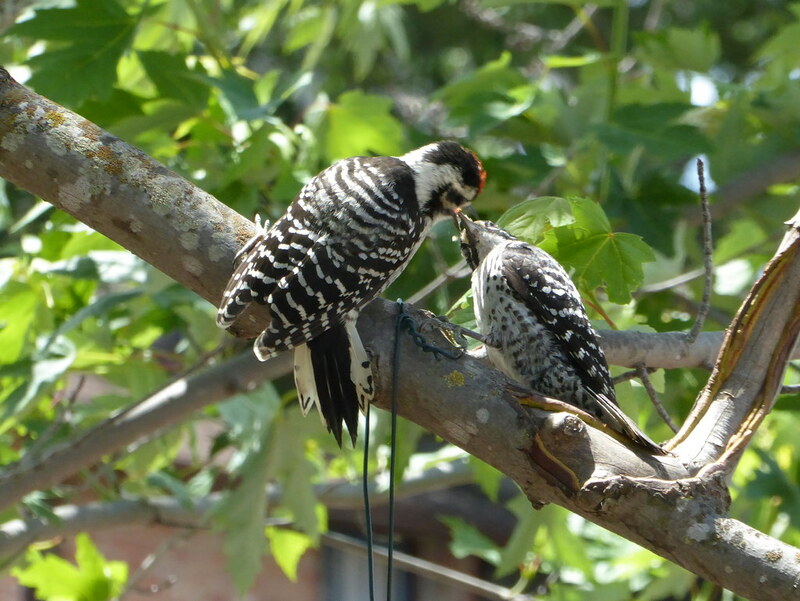 Then the Nuttall’s Woodpeckers, a mating pair coming and going from the feeder, and eventually bringing Junior along. And we’ve had juvenile Lesser Goldfinch, and then we got a few brand new House Finches (like we’re running low on those). This may have happened in years past (and since there are birds, I would say that is the case), but I am just tuning into this now. Here’s what the Chickadees assembled for a nest. 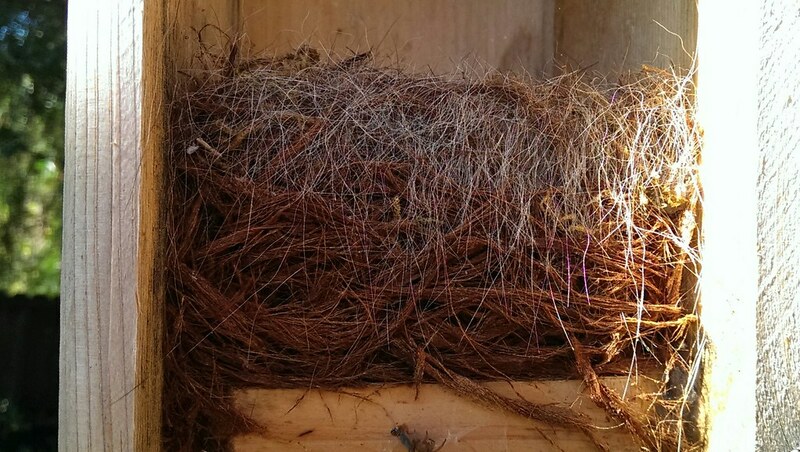 I’m not saying that I would move in here, but if you’re a Chickadee this is probably a pretty nice pad. They put some real effort went into this. When the young’uns were in there, the parents were back and forth non-stop, trying to satisfy the relentless demands of their offspring. Finally they fledged, and the nest box awaits new tenants. The Nuttal’s were much the same way, flying back and forth from the feeder all day, every day, for a few weeks or more. You can just imagine their lazy, no-good juvenile Nuttal back in the nest cavity, complaining about the quality of bird seed they brought back. Finally they brought him or her (both types of juvenile have a red cap) to the feeder with them. It was clear that they’d had enough. Like I said before, this has probably been going on for some time but I’m just now tuning into it. My backyard birding’s going into a new phase, as I’ve pretty much bagged all of the birds that are likely to stop by. No longer do I routinely set up for birding with my binocs and notepad at the ready. The chances of seeing a new one, especially during the summer doldrums, are not great. However, you can bag the usual suspects quite easily by observing them at some distance. That little bird way in the back that was there for two seconds? Bewick’s Wren. No other regular has the long upright tail feathers, and from past observations I know that the Bewick likes that part of the yard. And there’s that buzzer sound they make. Bewick’s for sure. On our walk back from downtown we heard some weird bird sounds from up in the tall trees at Sequoia High School. Sounds almost like a sea bird. There they are: two juvie Red-tailed Hawks, practicing their high keening predator cries, or just complaining because their parents hadn’t brought anything back to the nest recently. There should be no shortage of birds this year, based on our observations.